Signs reading "GWB Mercado/Market" went up near the entrance to the long-awaited George Washington Bridge Terminal at 178th Street and Broadway. 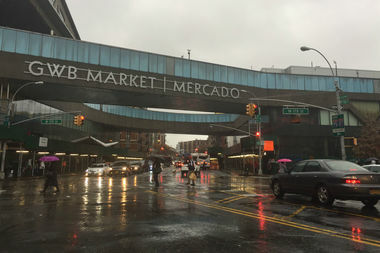 WASHINGTON HEIGHTS – The long-awaited George Washington Bridge Terminal — which has been riddled with delays and challenges since it was first announced in 2008 — took a step closer to completion as signs reading "GWB Mercado/Market" went up near the entrance. The project, which was slated to be completed by mid-May 2015, was delayed after encountering several “construction challenges” that pushed the date back even further, said a spokesman for the developers George Washington Bridge Redevelopment Venture LLC — a private development company overseeing the redevelopment of the half-century-old terminal in conjunction with the Port Authority. These delays included construction conflicts with several of the small businesses owners slated to open their projects on the site. But in recent weeks, new signage went up along Broadway, where the bus terminal meets the George Washington Bridge, and sources say the project could be nearing completion early next year. Neither the developers nor the Port Authority replied to requests for comment on a new opening date. Small businesses have complained about the developers' lack of transparency about the process, as well as long delays, skyrocketing costs and inflated prices including a $2,000 fire extinguisher. However, multiple small businesses told DNAinfo they are cautiously optimistic they could be seeing signs of progress, after the developer sent them an email Monday offering them options to tour the site in the coming days. Luis Perez, who signed a lease in fall 2014 to open a juice bar and pastry shop inside the terminal, said his cost estimates from the developers’ chosen construction company, The Espinosa Group, jumped from $150,000 last summer to to nearly $300,000 this spring — with no explanation of the increase. Guillermo Reyes, who owns three optical businesses throughout Manhattan and The Bronx and has been planning to open another one inside the terminal, said his estimates jumped from approximately $75,000 — which included $10,000 for the ceiling and a fire extinguisher that was listed at $2,000 — to $129,000 in the spring. Supermarket chain Fine Fare Supermarket is the latest small business to raise concerns about the Port Authority's handling of the terminal construction — as owner Miguel Luna says the Port Authority's chosen developer has been driving up costs of construction that are preventing him from moving forward with opening inside. Luna said when he first signed on to the project in 2009, the developers didn't gave him an original estimate to sign the lease. But over the course of the past seven years, he said, their quoted construction estimates rose from approximately $500K to almost $1.7 million. Luna, who owns four supermarkets in the tri-state area, said he received an estimate for construction costs last summer of $533K. He said he still insisted on using his own contractor to complete the work, citing the prices the developer proposed weren’t even close to what he’s invested in his other stores. Instead, the Port-Authority-approved developers provided Luna with a second round of estimates in the spring of 2016 with an almost 100 percent increase ranging from $1.1 million to $1.7 million, he said. “It was so ridiculous,” Luna said. Community Board 12 chair, Shah Ally said the Business Development committee has been working with small businesses who have been left out of the GWB terminal development process to try to resolve their concerns with the Port Authority. Ally said he was also scheduled to speak with the Upper Manhattan Empowerment Zone to talk about the issues.